We start the podcast with IPL news. 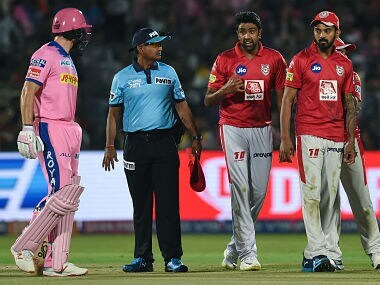 Kings XI Punjab defeated Rajasthan Royals by 14 runs in a thrilling match that seesawed in the closing stages and even saw some controversy in its aftermath. Chris Gayle announced himself in this edition of the IPL with a blistering innings, scoring 79 runs from 47 balls, including eight boundaries and four sixes. Sarfaraz Khan scored a quick 46 runs from 29 balls that helped take Punjab to 184/4 in 20 overs. Ben Stokes and Jaydev Unadkat had a terrible outing with the ball, ending with economy rates of 12 and 14.66 respectively. Jofra Archer, on the other hand, bowled extremely well, conceding only 17 runs in his 4 overs. Chasing 185 for a win at home, Rajasthan Royals fell short, finishing with 170/9. Jos Buttler, who scored 69, and skipper Ajinkya Rahane, got Rajasthan off to a brisk start, dealing in boundaries and sixes to pile up 64 runs in the first six overs. With the score on 108/2, Buttler was backing up a bit too much for KXIP skipper Ravichandran Ashwin's liking at the non-striker's end. Ashwin whipped the bails off with Buttler outside his crease — a controversial act known as 'Mankading' that has over the years generated a lot of debate. The two international stars were soon involved in an angry discussion at the centre, with the on-field umpires going upstairs for confirmation before declaring Buttler out. Rajasthan's chase never recovered from that dismissal. Steve Smith, who was playing his first IPL match in two years, Sanju Samson, Ben Stokes and Rahul Tripathi departed in quick succession in search of quick runs, leaving the innings in tatters. When asked why Bumrah was still in Mumbai while the team had left for Bengaluru, the official said,"Since the reports came late and the team has already left, he is travelling separately." News from Kabaddi now. A total of 29 players have been retained by their respective franchisees of the Pro Kabaddi League under the 'Elite Retained Players' category, the organisers of the PKL announced on Monday. The Elite Player Retention cap has been increased from a maximum of four to six. Franchises can retain up to six elite players from either category A, B or C, with a maximum of two each from Category A and B. The League has also introduced a new category where a franchise can retain a New Young Player, once his two-year contract is completed under the Retained Young Players category. These retained young players are over and above the existing cap of six "New Young players" that a franchise can have. Alfa Romeo have links to Ferrari, who signed him on as an academy driver in January. Michael Schumacher's son became the European Champion at Formula Three level with Prema last year, and will make the step up to Formula Two this season. Football news now from the Premier League. Chelsea have lodged an appeal against a one-year transfer ban to FIFA’s Appeal Committee and the case will be heard on 11 April, the sport’s world governing body said on Monday. FIFA had denied Chelsea’s request to freeze the ban during the appeal process. The club said they were “astonished” when the governing body denied their request to freeze the ban during the appeals progress, and could now take their case to the Court of Arbitration for Sport, as other clubs have done in the past.